Once both switches are created, you should see them both under logical switches showing a status of ‘Normal’. 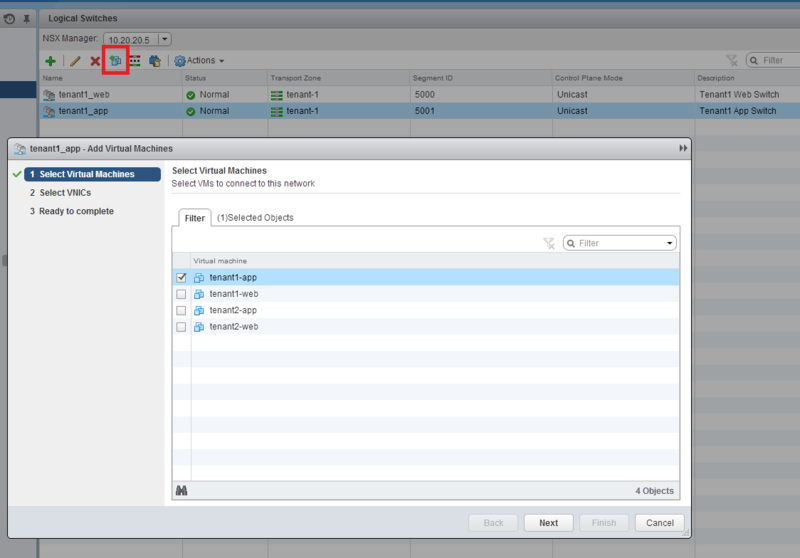 Note that NSX allocated a segment ID for each of the switches out of the pool we created in the last post. 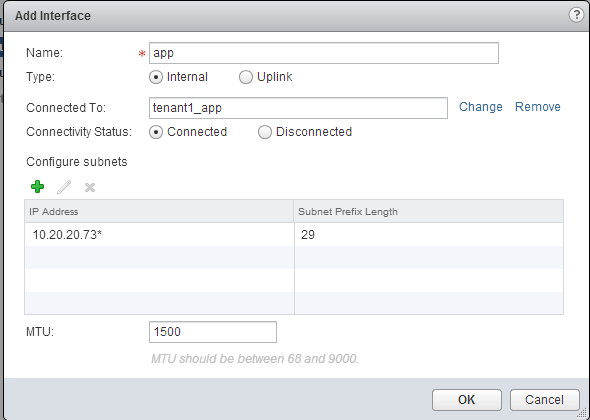 Note: For packet capture reasons, I decided to deploy my DLR controllers on the management cluster. In order to do this, I had to go back to the transport zone for tenant1 and add the management cluster to the transport zone for tenant1. Despite doing this, the change didn’t seem to ‘take’. 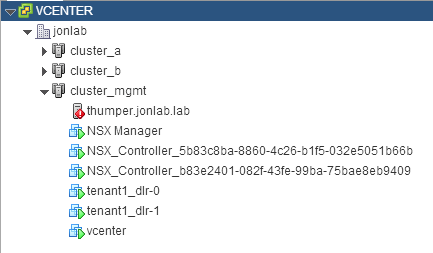 I rebooted the NSX controllers, then the managers. I still couldn’t provision the DLR’s to the management cluster. 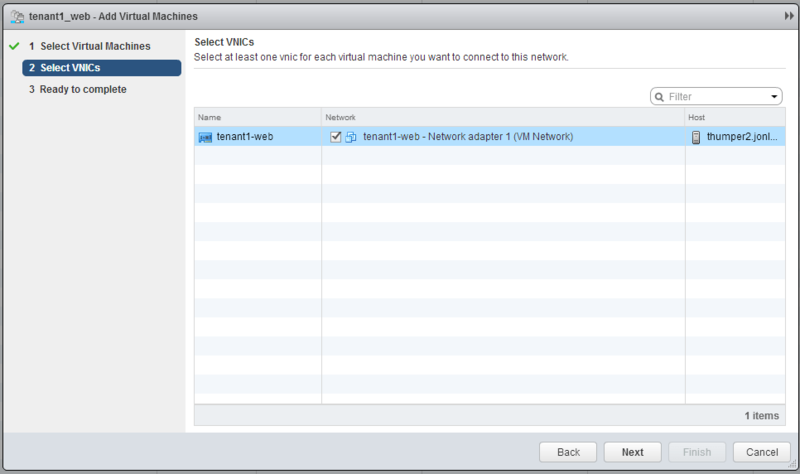 I finally rebooted vCenter which resolved the issue. 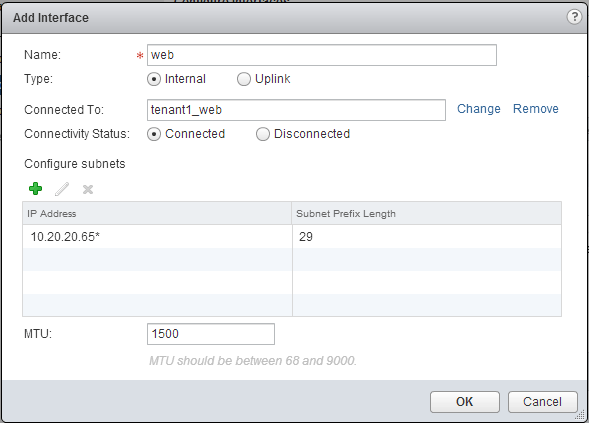 Note: If you noticed, you don’t get to pick a default gateway for the management IP. What does this mean? As far as I can tell, it makes the management IP useless. I’ll need to follow up on this to see what it can be used for. 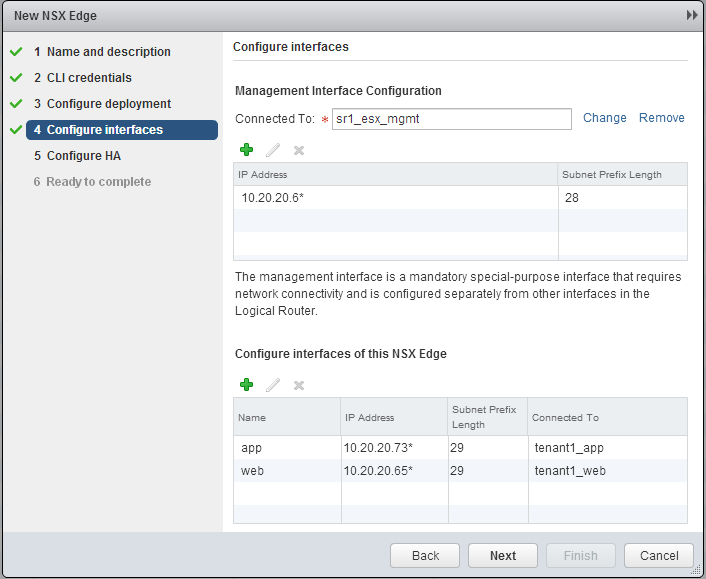 On the last screen make sure that everything looks correct and then click finish..
After you click finish, NSX will begin deploying the DLR VMs. 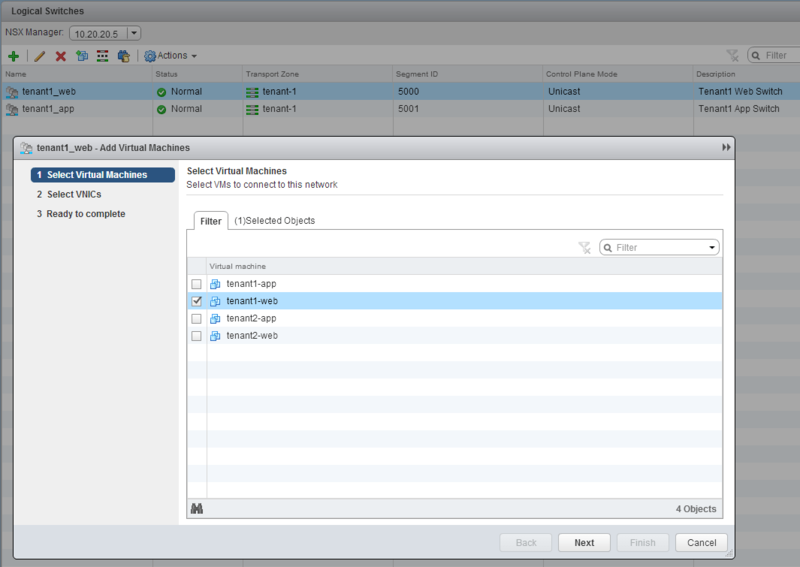 Keep in mind that these VMs aren’t in the data path, they just provide control plane operations to the DLR located on each physical ESX hosts. 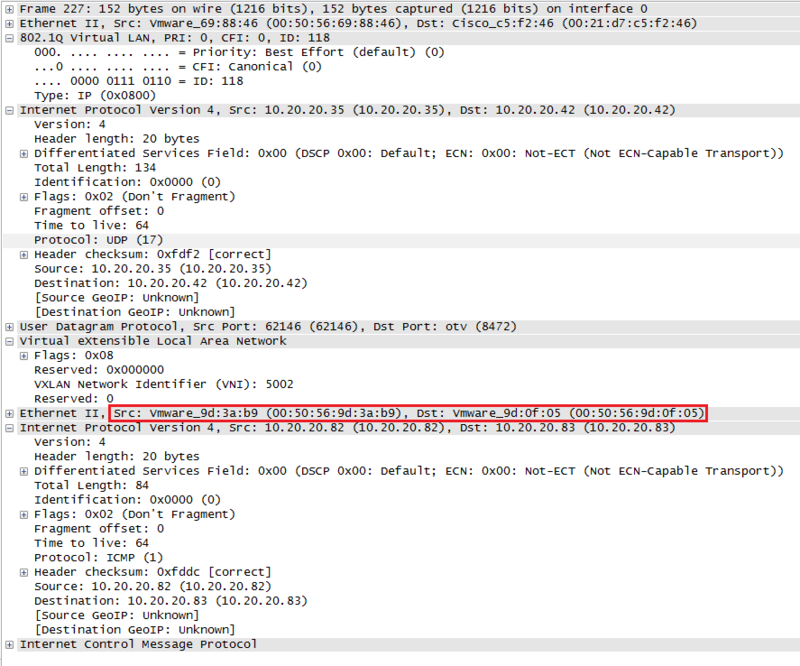 With the black dotted line I’m showing the path that the VMs traffic took to reach the web server. Seems like nothing’s changed really right? We’re still routing. 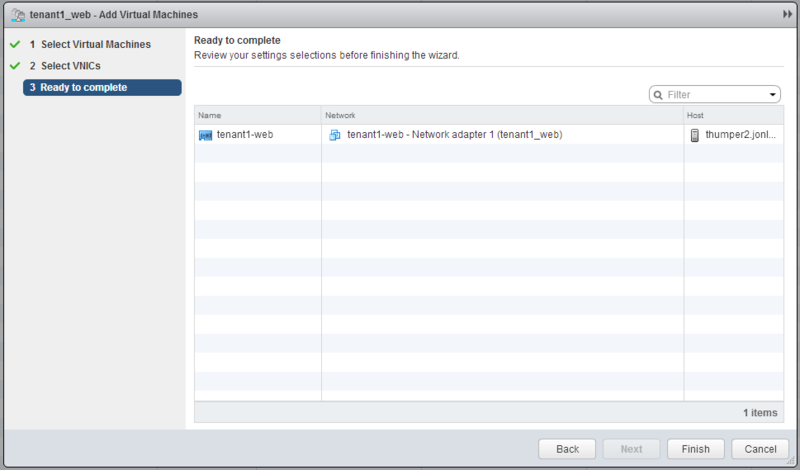 Actually, a lot has changed, we’re tunneling the routed VM traffic with VXLAN. 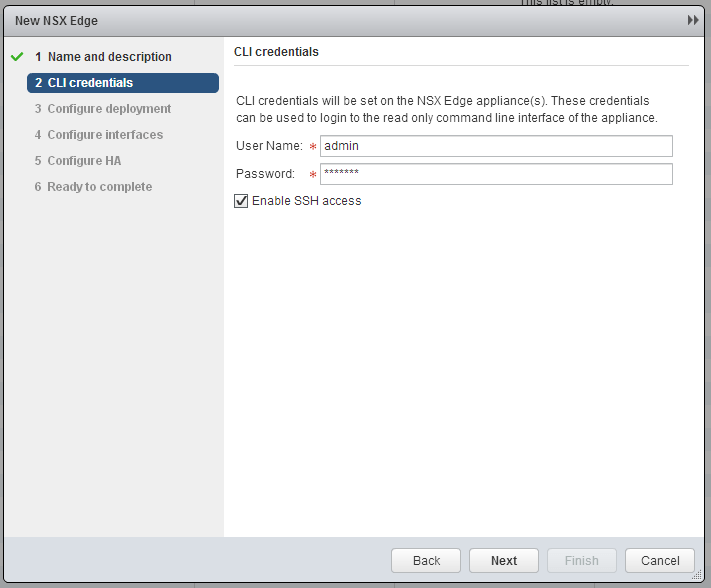 1 – The app server tries to talk to the web server. Being off subnet, it needs to talk to its default gateway which is on the DLR. 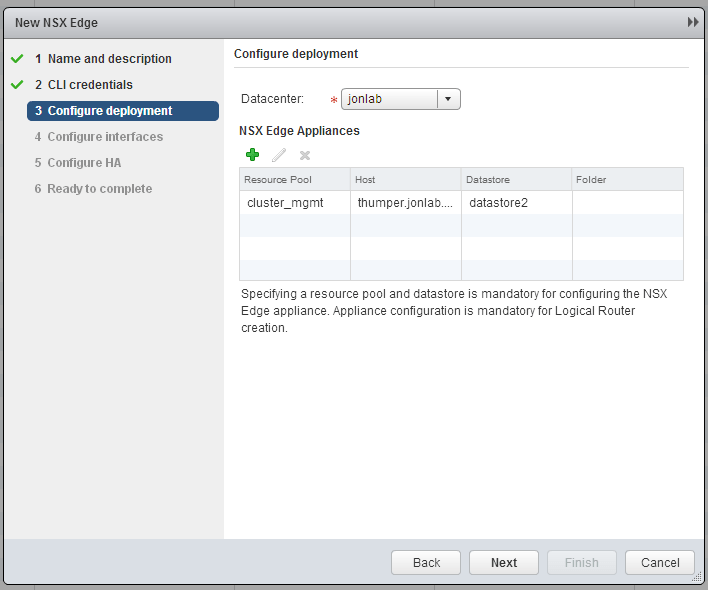 2 – The DLR on the local ESX host receives the traffic and knows that the destination (the web server) is on one of it’s directly connected interfaces. That directly connected interface is logical switch tenant1_web. 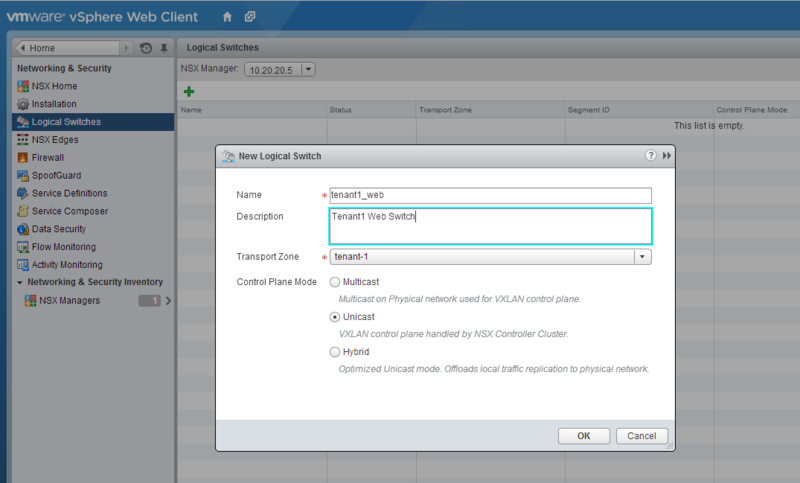 Through the NSX control plane the DLR knows that the web server is actually on another host. It encapsulates the original packet in a VXLAN header and sends the packet towards the physical network. 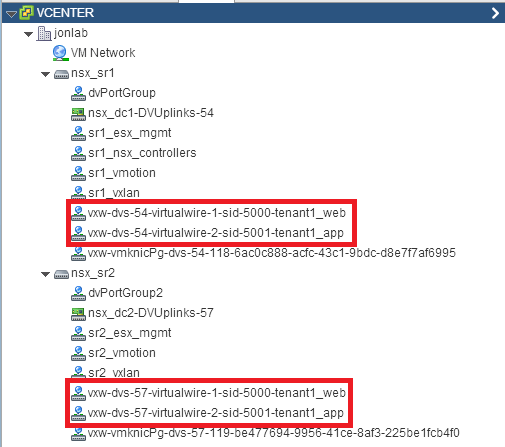 3 – The encapsulated VXLAN packet now reaches the physical NIC and has a source of the VTEP interface on Thumper3 and a destination of the VTEP interface on Thumper2. 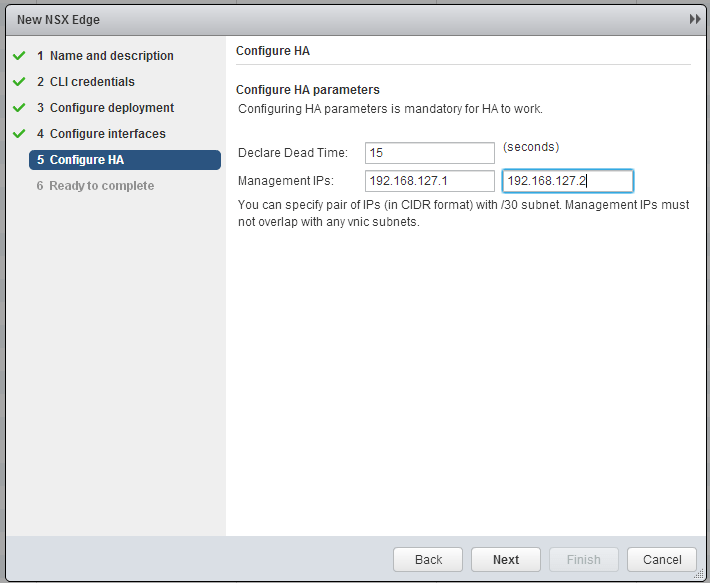 The ESX host must now encapsulate the packet in a dot1q header for VLAN 119 to get it onto the physical network. 5 – Leaving the physical switch the packet needs to be retagged with another dot1q header for VLAN 118 which is the VLAN where the VTEP interface for Thumper2 resides. 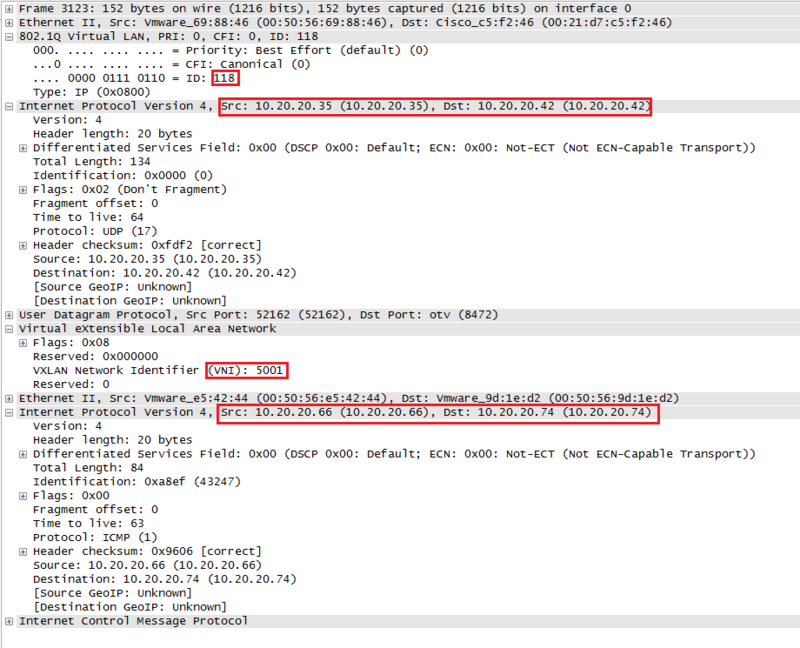 8 – The Web server receives the packet. 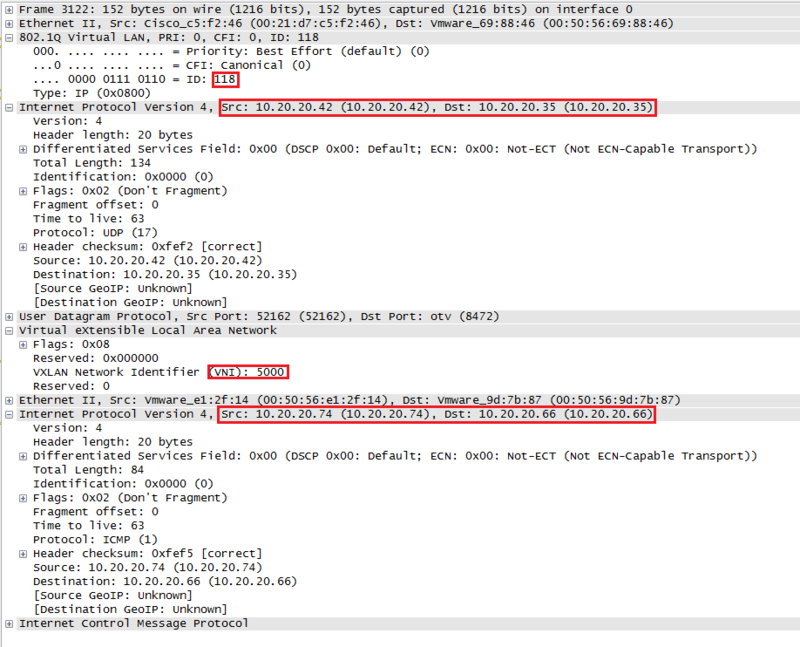 Note: The VLAN tag shows as 118 in both packet captures. This is because I was only spanning the packets on the switch interface facing Thumper2. 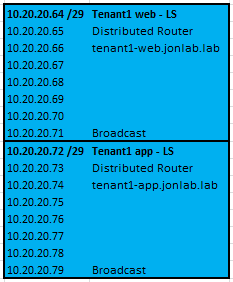 -The original data packet has a source of 10.20.20.74 (Tenant1-App VM) and a destination of 10.20.20.66 (Tentant1-Web VM). 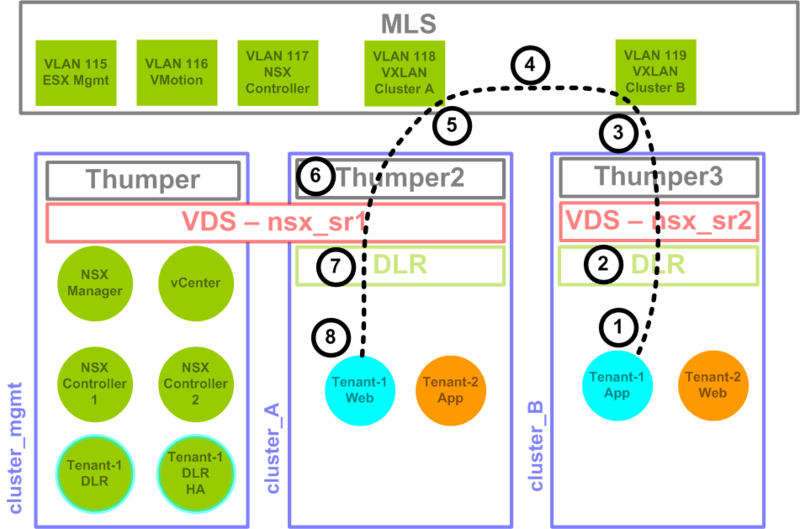 The VLXAN encapsulation is what makes NSX so powerful. 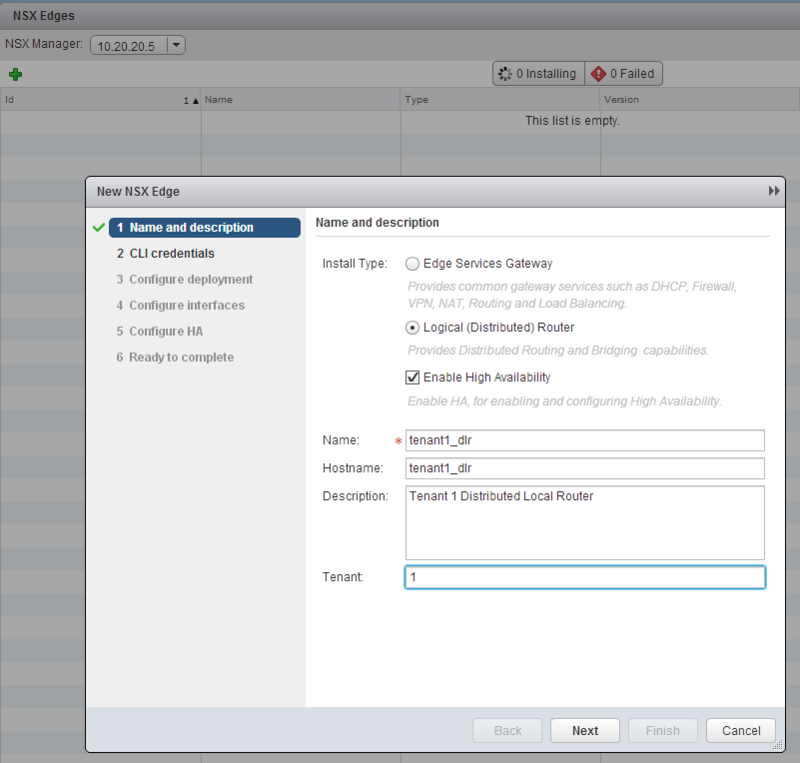 We can fully encapsulate layer 2 and layer 3 in a layer 3 header and route it. 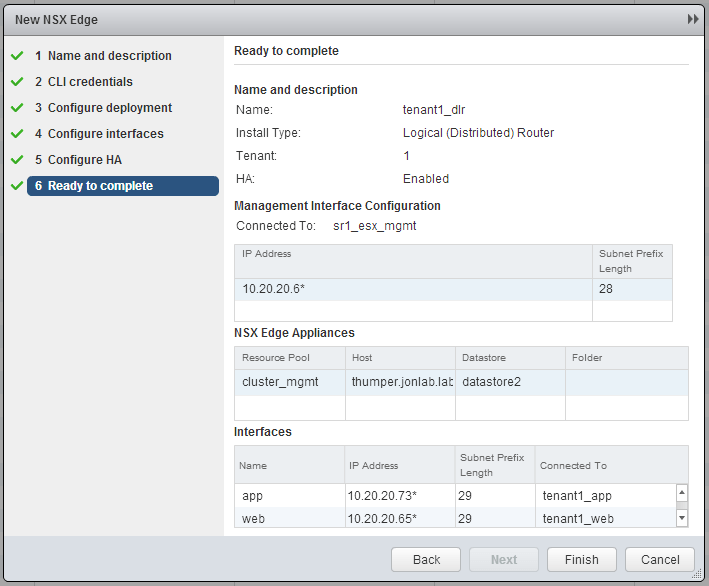 So like I said, this is nice and all, but let’s look at an example of where NSX can really shine when using VXLAN. Let’s move ahead with setting up tenant 2. 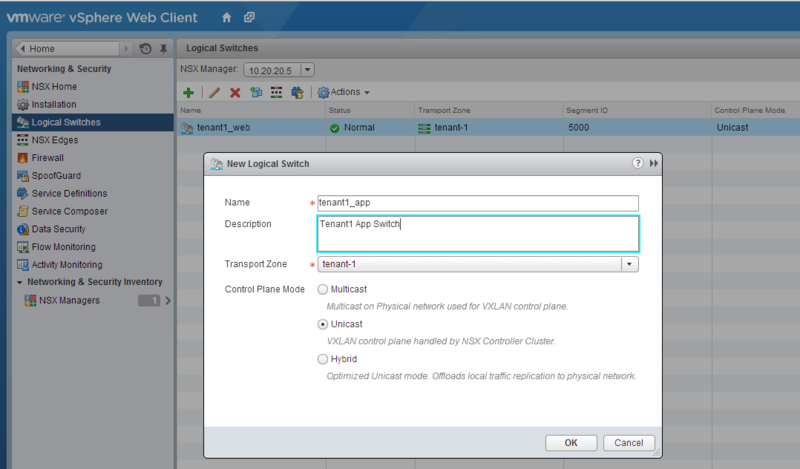 As we’ve seen today, NSX can create logical networks to encapsulate layer 2 and layer 3 network traffic inside of VXLAN. 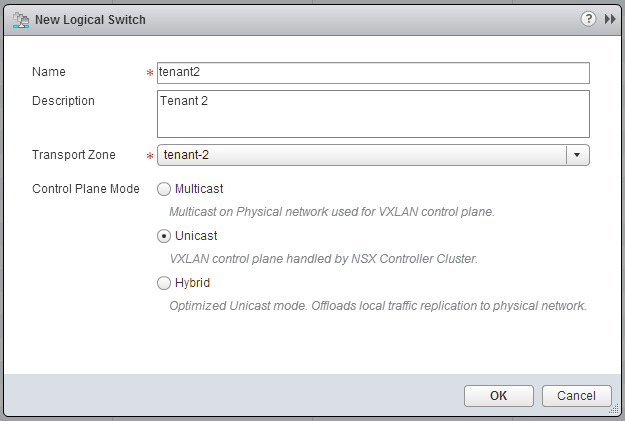 In addition, NSX’s control plane removes the need for me to support multicast on the physical network gear when using VXLAN. AKA, this all just sort of worked without having to tweak my physical network config. Next up we’ll start looking at routing logical networks back to the physical network.